Service Costs > How Much Does Deer Processing Cost? How Much Does Deer Processing Cost? A professional deer processing service will process the entire deer that includes skinning and processing the meat into cuts such as hamburger, steaks and sausage. The cost is going to greatly depend on the processing company, what you want to have cut, the size of the deer and geographical location. For example, Clay’s Deer Processing located in Texas, charges $85 for just the processing, while Skoglund Meats, another professional processor we found online, charges a flat $0.75 per pound to grind and package the meat. Brats and sausage can cost anywhere from $1.75 to $4 per pound depending on the type of sausage. Some popular types include Italian and Smoked Polish Sausage. Shrink wrapped summer sausage can cost anywhere from $9 to $17 for a 3-pound stick or about $12 to $22 for a 3-pound flavored stick such as cheese and/or jalapeno. Snack sticks or jerky can cost anywhere from $4 to $8 per pound. Hamburger can cost anywhere from $0.65 to $2 per pound. Adding additional flavors, such as bacon, into the hamburger can increase the price. Bacon can cost anywhere from $4.50 to $7 per pound. Lunch meat can cost $0.95 to $2 per pound. According to this Field and Stream forum thread, one member said he paid about $80 for a standard burger and roast, and summer sausage would be an additional $2 to $3 per pounds. Another member claimed he paid a $75 flat fee for custom cuts and 20 pounds worth of summer sausage. Refer to our table below to see what the average price per pound is for popular cuts. This price won’t include the processing fees mentioned above. 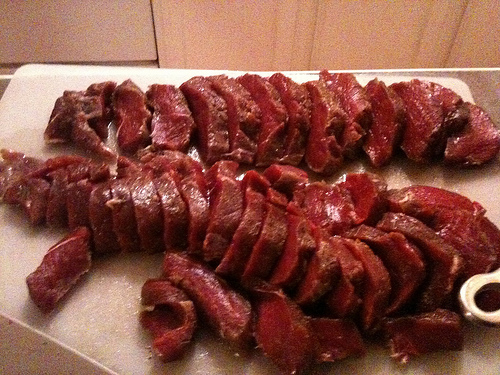 The processing of the deer is going to include the skinning, cutting, as well as wrapping and tenderizing the cuts. When you arrive at the butcher, you will receive a sheet to fill out what you would like done, and then, each item will be priced depending on the weight. Once processed, each cut will be organized and shrink wrapped so that you can take it straight to the freezer. Reputable processors will tag and keep your deer separate so you receive only your meat, not others. Most will ask for a small deposit to start your order, which is usually about $50 to $75. Most processors, depending on the season, could take up to 14 days to get you the meat back. This timeframe can be even longer if your order includes sausage and jerky due to the process. When the deer is dropped off, it will immediately be skinned, cleaned and cooled for storage. Disposing of the carcass may be an additional charge, about $5 to $15. Some processing companies may charge extra to vacuum seal and wrap items such as sausage. This can cost an additional $0.25 to $0.50 a pound. Tenderizing may be included in the overall processing fee, but this is not always the case. If the processor does this on the side, it may cost $15 to $35 extra. Many processors can tan the hide and return it for a small fee, usually less than $75. If the deer needs to be caped for a shoulder mount, this can be an additional $50 to $100. Mixing in additional flavors with the meat may cost extra depending on what you prefer. For example, adding cheese to the sausage sticks may bump the price up to about $1 to $2 extra per pound. Rushed orders can increase the costs by more than 40 percent. If your meat isn’t picked up during the time frame, some processors will charge a daily storage fee. Most processors have a minimum for certain cuts. For example, some processors request you purchase a minimum of at least 25 pounds if you were to want summer sausage. How much meat comes from a deer on average? After field dressing, the average 75 to 125-pound deer will yield about 50 percent of its weight in lean, boneless meat. Do you have to field dress a deer before taking it to a processor? Most processors recommend bringing the deer in “as-is” as this can make the process a lot easier and can be more sanitary. However, if doing so, it’s important to take the deer directly to the processor after loading it to make sure the meat doesn’t become infected with bacteria, spoiling the entire carcass. Before using any service check with two to three places either by phone or online. Most are more than willing to give you a quote right away over the phone or on the website.